Ar ais arís le roinnt tips daoibh ó Natalie O'Brien, an gruagaire a bheidh ag déanamh na gruaige go léir don bhainis. Is bean iontach í le go leor taithí agus tá an t-uafás tips agus tricks aici daoibh. Tá cúpla 'style' curtha leis an mblag seo atá déanta aici agus is aoibhinn liom iad ar fad. 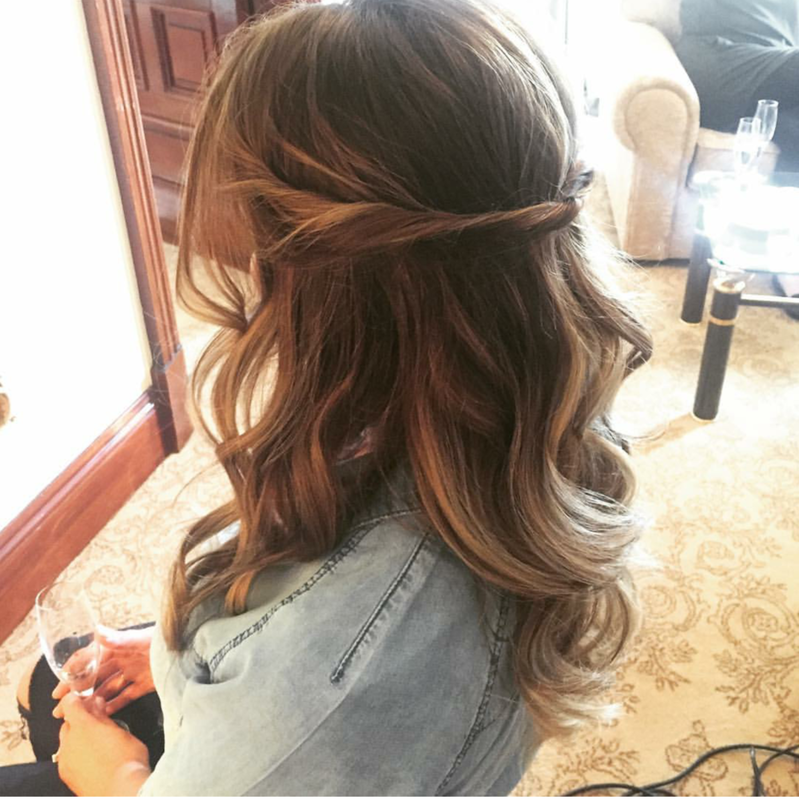 Natalie here, I'm sharing a few tips and tricks to get your perfect wedding hair. 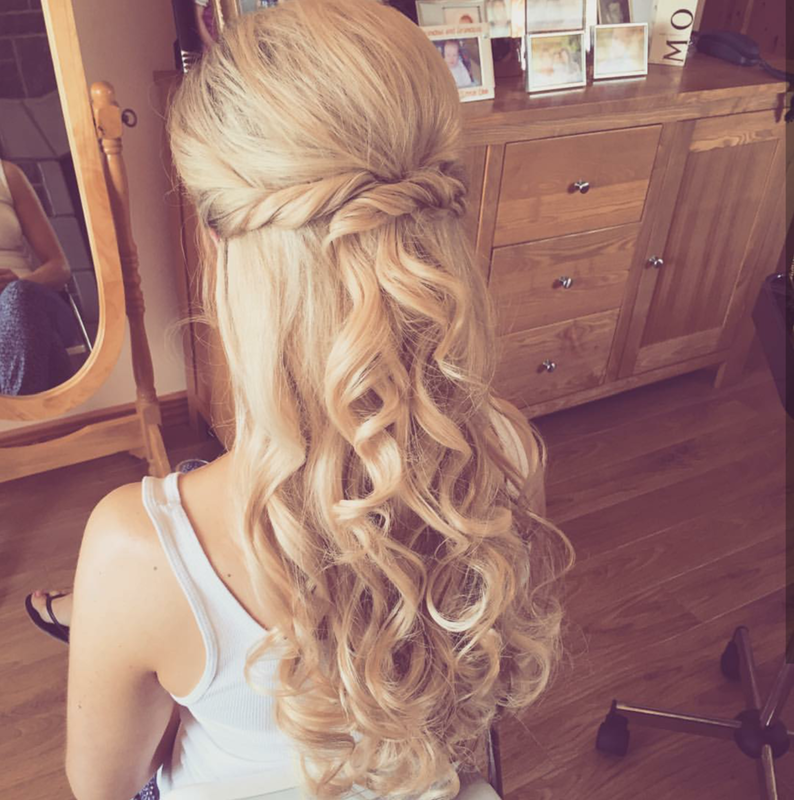 Getting your hair ready for your big day does not mean your have to let your hair grow down to your knees with no layers or shape to it (it does not have to be that scary ladies). I get asked a lot "What should I do to get my hair ready and what products should I use?" My advice is to start using the right shampoo and conditioner for your hair. Invest in a salon brand like Wella, Redken, Kerestase etc.. Ask your stylist what they recommend. Start getting regular treatments when you get your hair cut/coloured but do avoid treatment the week of the wedding as you need to have some hold in the hair on the day. It's also a good idea to get a plan in place with your stylist for your colour and what you want to achieve for the day. Get your hair cut as often as it needs it, every 6-10 weeks. You do not have to go with shapeless hair for a year before your wedding. Layers are a good thing. A lot of the styles you look at on pinterst, magazines etc. if you look closely, they have shape and softness around the face or texture throughout. This is hard to achieve on hair that is all the one length. With down styles, you need movement through out the hair otherwise the hair is heavy and will drop very quickly. Another big question I get asked about is hair extensions...... Girls don't be afraid. 90% of the styles you see online have some sort of extension or padding added. I think when we hear extensions we automatically think fake, tacky, painful . Long gone is the day where extension were 20 inches longer than your own hair (thank god). Extensions can add volume to the hair and that small bit of extra length for when you curl your hair. They also give hold to hair that drops out very quickly. When choosing the right style for big day, I always say to my brides, do what you are most comfortable with. At the end of the day you are the person that is wearing it and it will be you looking back at the pictures. If you are the type of girl that never wears her hair up, then why do it on your wedding day? I know it's very important to compliment your dress. If you have a lot of detail on top or the back of the dress that you don't want to take from there is always a way around this. Maybe sweep it to the side. Pin it half up so you still have some hair down and it's not taking away from the lovely detail. Picking a style can be hard. Always keep in mind the colour of your hair (blonde upstyle always show off more detail, sorry brunettes) but dark hair has a lovely shine. It is always easy to add a few tones to dark hair to give it more definition and texture. This is why it's best to have a colour plan in place with your stylist. It's hard to pick a hair style if you haven't got your dress. If you are going for a vintage style dress, then boho curl probably won't suit. It's good to keep in with the theme as it all comes together on the day. On the day of the trial be open to ideas. What you like in a picture might not suit you or your hair type. But this is what the trial is for, to play around with ideas and tweak things a bit to suit you. And then on the day of the wedding to prefect the final look. A good idea is to take loads of pictures of the different styles and show your friends/family or bring one of them along with you. A crowd of people can be a bit over whelming on the day of the trial (as you probably know by now, too many opinions is not always a good thing). If your hair get oily/ greasy then wash it (simple as that) no one wants oily hair for their wedding. Wear something that you do not have to put over your head after you hair is done. Robes are perfect, but not the big fleece robes, the collar is too high and chunky and will rub of the hair style all morning (it's like wearing a hoodie) Plus you get very hot in them, even in the winter. Always eat breakfast, no one wants a hangry bride lol. And finally relax, chill , have fun and loads of laughs. It's probably the most time you will spend chatting to your girlies for the rest of the day so enjoy it. Make loads of memories and take loads of selfies. Is féidir libh dul i dteagmháil le Natalie ag www.natalieobrienbridalhair.com nó ar a leathanach Facebook nó a leathanach Instagram. Tá súil agam gur bhain sibh taitneamh as an gcomhairle sin ar fad.